Well, as far as we could figure, not much. Noor Roy Choudhury (Sonakshi Sinha) is a university topper. She lives in a Mumbai apartment whose living room is the size of a tennis court. Her dad's this mild amicable man who isn't even pushing her to get married, and her cat is a lovely ginger that doesn't even scratch. She has friends - a hot woman (Shibani Dandekar) who looks after Noor and a successful London-based restaurateur (Kanan Gill) who flies in to Mumbai to visit Noor. The girl's got a car, a job, enough money to hang out in Colaba Social (some of us can't even afford to look at the menu on Zomato), and a maid (Smita Tambe) who'll clean up her mess and even get the geyser fixed for her. Yet she complains and complains. She complains about not having a boyfriend. But she dumps a wealthy and good-looking Harvard grad because he's a mama's boy. She complains about being fat but we calculated Sinha's BMI and it's 24.5. Forget fat, that's not even overweight! (We know because this reviewer has been negotiating a BMI of 27 for a while now). The only legitimate complaint she has is that the quality of work she gets in her office is lousy. But before you begin to feel for her she gets a big break. There's an organ-harvesting scam afoot, and Noor's the first to get wind of it. But before you begin to feel happy for her, the film lets us know exactly how lousy a journalist she is. See, we definitely don't mean to say a girl shouldn't have trouble in her love life or issues regarding her body image or difficulty in finding meaningful work. Dear Zindagi did something similar, and despite its shortcomings it worked as a film. The trouble with Noor, though, is not the first-world problems. It is the ramming in of very real and very dirty issues into the cotton candy that is Noor's world. So, well, what's wrong with Noor? In as far as we could figure, almost everything. 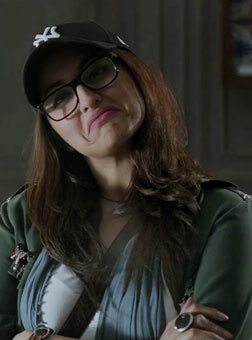 To start with, Noor is a film where small-time actors play hotshot divas born with silver spoons in their mouths. Shibani Dandekar and Purab Kohli may have no films in their respective kitties but in Noor they're respectively a hot model who has not a care in life and a celebrated war-journalist whose photographs are exhibited in art galleries. Further, Kanan Gill, the unpretentious and relatable Youtube comedian, plays a high-flying London restaurateur and philanderer. All this while Shatrughan Sinha's daughter is playing the loser who is ruing the lack of opportunity in her life. But hypocrisy is no sin in Bollywood. We get by. So we look to other things. Like, maybe, a story that engages. There's an underdog, an organ-harvesting scam, a big mess up, a Hriday Parivartan, and the fact that this is an adaptation of a bestselling novel (Karachi, You're Killing Me by Saba Imtiaz). Notwithstanding all of these bullet points and keywords, the film is - there is no other way to say it - daft. It talks of the poor being taken advantage of, of people getting killed, of corruption, of apathy, and crony capitalism. There's a big villain who is up to no good, and he is so powerful that people shudder at the thought of standing as witness against him. And how does Noor collapse this Goliath? By recording a monologue called "Mumbai, You're Killing Me" and uploading it on Facebook. Yup, that's all. That's absolutely all it takes to change the world - a rant from your bedroom. And Sonakshi Sinha isn't a fraction of the performer it takes to pull off this sort of a feat. We wonder if even Konkona Sen Sharma could have made it seem plausible. The monologue/rant is poorly written, meanders all over the place, is childish often, and ends with "Beep you, Mumbai. Beep the builders. Beep the politicians. Beep you for beeping me." There. A film that doesn't even try to stand up against the censor board is lecturing us about standing up against the system. It isn't that the social media can't be a powerful catalyst in revolution. Lots of issue-based films nowadays invariably employ viral posts as plot devices (Dhanush's VIP is an example where the conceit works), but in all these films you are given some footage of people reading the post or watching the video and responding to it. You get to see people moving their butts and going forward to further the post's cause. When you watch enough people feeling something intense, and if you are feeling charitable, you buy the plot device. In Noor, though, you aren't shown any humans. Sinha delivers her monologue, posts it online, and there's a flurry of onscreen tweets, Facebook posts, sounds of people talking, and more tweets and more Facebook posts, and the world is changed in less than 60 seconds. With no actual faces or human expressions involved in the whole process. This is the kind of shallow direction you'll find throughout Noor. Sunhil Sippy (the director) hasn't got a clue on how journalism works. There's not a single enriching insight he gives you and not a single uplifting emotion he makes you feel. He does things like showing a quotable quote on the screen with grunge effect and expects it to stand in for filmmaking. The only thing he manages to get right is the hiring of talent. Amaal Malik's tunes are breezy although they sound too much like Amit Trivedi. And Keiko Nakahara's cinematography is the definition of aesthetic. There are some impressive frames like a shot from above of people holding umbrellas in a local train station during rain. Clearly there was an effort made to make Mumbai a character. But then, everything is just too pretty to be gritty. That's what's wrong with Noor. She doesn't have issues that warrant all her complaining. The film doesn't have the bite to warrant our viewing. Be the first to comment on Noor! Just use the simple form below. fullhyd.com has 700,000+ monthly visits. Tell Hyderabad what you feel about Noor!